Ah Lloyd, I see you bought the "Predator" model then (What with the self destruct and all). Blake, it is not HD, but no small monitor really is. it is 800X480 which, at 8inches is enough resolution to focus reliably. I love what you did with the Case.. I posted about recommendations for cases between the 1600 and 1650 a couple weeks ago, and you just sold me on the 1650!! Thanks, and like most people in here, I would love to see some footage from it when you have some.. I have been looking for a follow focus system for the XH A1 but needed it to be usable on the fixed lens since i don't have a 35mm lens adaptor. I do use a Raynox tele converter so i ended up buying a set of rails to help support that, meaning i had the rails to support a follow focus, but so far, i have only been able to find one follow focus system that works with a "friction" wheel. Not knowing just what the quality would be like of that one, i decided to give it a go to make my own. I started looking into small gear boxes but was put off by the ridiculous prices of these, i mean, over $400 Australian i think is a joke. Anyway, in the end i just bought some gears, some bearings & some stainless steel rod to suit on the internet. The whole thing pretty much, is made out of aluminium, & i made it to suit the set up i have rather than trying to make it adjustable since i figured it was only for my set up & wouldn't need to be changed. The gear that drives the focus ring on the lens is a nylon gear that comes from a "hobby set" of gears, it just worked out that it meshed with the ribbing on the lens ring perfectly. I still need to do some minor tweaking with the nylon gear as it is not perfectly centered, but that won't be too difficult to sort out. I may even make up a whole new gear from aluminium, but first i'll see how it goes with this one. I haven't played around with it too much yet, but from my initial tests, it works very well, & focusing is much easier. The Indifocus was the one i had seen with the friction wheel, but that's the only one from what i have seen. If i had added up all my time to make this, & the cost of the parts, then it probably would have only worked out a little bit cheaper than the Indifocus, but i sure had fun making it! Wow! I had never used a follow focus before i made this one, but now that i have, i wonder how i ever did without it! I have just spent a few hours using it, & i can't believe how much easier it is to adjust focus. Not only is it a more natural movement that you make when using it, but the adjustments to the focus that can be made are far more precise. As i wrote in my first post on this thread, i need to tweak the friction gear to make it work better, & now that i know how well it works, i am really keen to get it sorted. I also want to drill holes in it to reduce the weight as much as possible, & do the same to the lens support i had made earlier to support the Raynox tele converter. I will then look in to getting them both anodised in matt black, which should make them at least look a bit more professional. Can you explain to me the situation in which you would use a follow focus? I have never used one and am not sure exactly what it is for. 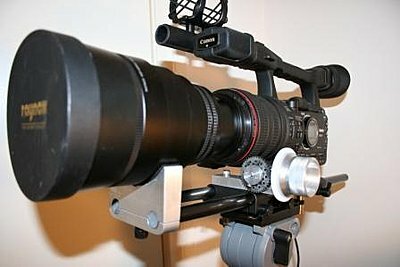 Is it for when you physically are moving the camera closer to a subject and need to keep focus? Is that why it's called "follow" focus? It looks like you just worked a mechanism so that you can change focus with a knob on the side instead of the ring on the barrel. Is this correct? Now with this unit in the way of your aperture and zoom rings, how do you adjust zoom and aperture? I like the idea of the knob on the side for focus, but what else does it do? Great. So it is just another way of using the focus ring. Cool. I understand that. But what about the issue with the zoom and aperture rings? I'm sorry, I do event videos (car and truck shows) and move the camera a lot and there is a lot of adjusting of everything. I like the fine control of the focus with the follow-focus setup, but I need access to the other adjustments. BTW, your setup looks nice and very clean. Well done. 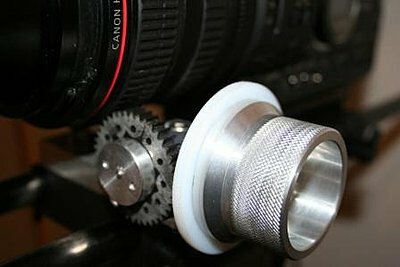 Zoom ring is for a fast zooming between shots - for news reporters etc. 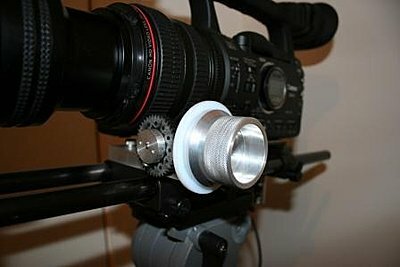 During filming you should use buttons on the right side of the camera with smooth motorzooming. Aperture work in steps. You don`t need extra sensitivity. The Instant Focus module does look like it's just screwed onto the lens with two small screws. So maybe it will be possible to remove the entire module? If it is, hopefuly the IR emitter isn't hard wired to the rest of the camera and there is some standard connector there. A connector would be awesome because then we could remove the module and disconnect the connector. The IR sensor is also blocked if you put a matte box on the lens so being able to remove and relocate the module would be even more important if you still wanted to use Instant Focus. I wonder if the exact position of the IR sensor is important to the Instant Focus system and if moving it around will mess up the algorithms. Did anyone tried to remove the instant focus? I do not use it anyway. Thank you very much. Any thoughts appreciated. The fish is the last to know the water. Thanks Marcel for the tip. I will consider to replace it with the one I have got from India, which is also very good but unusable without their own gear rings which, of course, I cannot attach to the XH A1. My cameraman still complains about the sensitive/jumpy focus ring control on the XHA1. It makes it tricky to focus accurately on complex or developing shots. Anyone know if controlling the XH A1 with the available focus puller will allow for easier focusing? Is it possible they will make a firmware update allowing the focus speed to be better controled?